The world's first ship exclusively offering guests suites and balcony cabins with the best gourmet restaurants and personal service. Pure luxury! 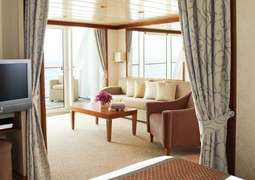 The Seven Seas Mariner offers only the most luxurious suites which range between 24m2 and 112m2 and leave nothing to be desired. Every suite has an amazing balcony and walk-in closet along with a safe. The suites are stylishly furnished and the mini-bar is restocked with high quality beverages daily. Tantalise your taste buds at one of the four gourmet restaurants on board. Go to the elegant Compass Rose Restaurant, the more casual La Veranda, the Prime 7 classic steak restaurant, the Chartreuse which is known for chic Parisian dining or at the Pool Grill for something in between meals. A nice relaxing coffee or snack can be enjoyed at the onboard café, Coffee Connection, or visit one of the other six bars and lounges. At the Constellation theatre you can enjoy phenomenal shows from musicals to cabaret along with artistic performances and the ship’s very own six-piece orchestra. You will find entertainment in the lounges from a number of different musicians which perform every day and then you can visit the nightclub later on in the evening. For anyone feeling lucky, there is also a casino where you can play blackjack, roulette, poker and craps. 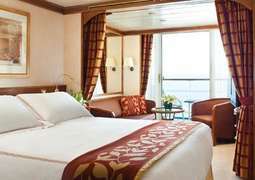 Aboard the Seven Seas Mariner there is much in the way of leisure of activities. If you'd prefer to have a more peaceful time on board then visit the well-stocked library where you can read, play a game of chess or rent a DVD. The Connoisseur Club invites you to try a glass of rare, vintage cognac with a particularly superior cigar before venturing into the casino. For those who need to work while on board there are two conference rooms perfect to hold meetings, lectures or other events. There is a special personalised consultation available for those who want information on trips to the destination countries. So that you can still stay healthy on board you can visit the gym, do a few laps on the jogging track or take part in one of the many fitness courses run by qualified instructors. The Canyon Ranch Spaclub offers a wide range of excellent treatments which can be tailored to your personal requirements. Then afterwards why not pay a visit to the salon on board? There is a butler service available to those staying in suites of the following categories: Seven Seas, Mariner, Grand and Master. During the day time it is perfectly acceptable to wear casual attire but due to the ethos of luxury on board we recommend more formal clothing during meal times. In the evenings it would be advisable for men to wear a suit and women to wear an evening dress.